Background/Aims: The aim of this study was to determine the optimal volume of peritoneal effusion required to diagnose malignant ascites. Patients and Methods: The authors recruited 123 patients with shifting dullness and obtained 123 peritoneocentesis fluid samples. The samples were divided into seven aliquots of 10, 50, 100, 150, 200, 250, and 300 mL for cytopathological examination. The sensitivity, specificity, negative predictive value (NPV), and positive predictive value (PPV) were calculated for each aliquot. Results: The sensitivity for the diagnosis of malignant ascites gradually increased as the sample volume increased and reached a constant value at a volume of 200 mL. The sensitivity and NPV for the 10-, 100-, and 150-mL volumes were significantly different from those for the 200-mL sample. However, the sensitivity and NPV for the 250- and 300-mL volumes were not significantly different. The sensitivity for the diagnosis of malignant ascites is closely related to the volume of peritoneal fluid that is extracted by peritoneocentesis. Conclusion: We suggest a volume of 200 mL as the optimal minimum volume to confirm malignant ascites in patients with shifting dullness. Malignant ascites is the accumulation of fluid containing malignant cells in the peritoneal cavity. Primary peritoneal or metastatic malignant tumors account for approximately 10% of all cases of ascites. Malignant ascites is an infrequent yet serious complication of terminal cancer and suggests a poor prognosis;, the mean survival period for such patients is 20 weeks from the time of diagnosis. Thus, the swift and accurate diagnosis of these patients is essential to ensure timely treatment and improve the prognosis of the malignancy., Unfortunately, the optimal minimum volume of peritoneal fluid required for a diagnosis of malignancy is not clear. The volume delivered to the cytology laboratory is generally less than what is collected from the patients. If malignant cells are found in a peritoneocentesis specimen, then the specimen is adequate regardless of its volume. However, if a small volume of specimen is delivered and yields no malignant findings, it is not certain whether this is a false-negative result due to the small fluid volume or because the sample is truly benign. To the best of our knowledge, no study, to date, has documented the equivalence optimal volume of ascites sample for the diagnosis of malignant ascites; this study appears to be the first of its kind. In light of the situation described above, we strove to examine how the volume of peritoneocentesis specimens impacts the accuracy of the diagnosis in peritoneal effusion cytology. We anticipate that an optimal cutoff value for the peritoneal effusion volume would provide a practical guideline for physicians when submitting peritoneocentesis specimens to a laboratory. Cytopathological inspection of ascites is the gold standard test to diagnose malignant ascites. Recently, some scholars have suggested that using a paraffin-embedded cell block method, in which there are more cells than in direct, enhances the collection of malignant cells in ascites. The paraffin-embedded cell block technique not only increases the sensitivity but also helps demonstrate better architectural patterns, which could be of great assistance in making the correct diagnosis of the primary lesion., Although many studies have compared the diagnostic yield of cytology from peritoneocentesis, needle biopsy, and peritoneoscopy, few have evaluated the optimal volume needed to make the diagnosis of malignant ascites. Between January 1, 2015, and October 31, 2016, 123 patients underwent diagnostic peritoneocentesis, including 69 females and 54 males. Patients with confirmed or suspected malignancy were eligible for the study. The suspected malignancy was determined by clinicians who ordered the peritoneocentesis because the patients presented signs and symptoms that included a history of a known malignancy, abdominal pain, weight loss, unexplained splenomegaly and hepatomegaly, abdominal mass, jaundice, bloating, ascites, and other symptoms caused by the effusion. All the patients had shifting dullness, defined as the presence of greater than or equal to 1,000 milliliters of ascites. After obtaining the ascites from the patients, followed by agitation to homogenize the cellularity, we divided the samples into seven aliquots, including 10, 50, 100, 150, 200, 250, and 300 mL volumes, which were submitted to the cytology laboratory. Initially, 20 mL was sent for biochemical and microbiologic studies. Each sample was submitted fresh. Peritoneal effusion was sampled transabdominally using a 20-gauge needle under ultrasound guidance by a trained operator. The entire volume of each aliquot sample was centrifuged for 10 min at 2,000 revolutions per minute (r/min), and the supernatant was discarded. Then, the paraffin-embedded cell blocks were prepared using the precipitate and were stained with hematoxylin and eosin. The paraffin-embedded cell blocks were processed by one cytotechnologist as per the standard protocol of the Second Affiliated Hospital of HMU cytopathology laboratory protocol. These cell blocks were analyzed by a single pathologist to confirm the presence or absence of malignant cells. All the specimens were reported as being either positive or negative for malignancy. The result was defined as positive when any of the seven cell blocks appeared to be malignant and was negative only if all the seven cell block results were negative. The gold standard test for diagnosing malignant ascites is the cytological or histological confirmation of the presence of malignant cells in the peritoneal effusion specimen within 6 months of the initial peritoneocentesis. The sensitivity of the different aliquots was calculated and analyzed. The sensitivities, specificities, negative predictive values (NPVs), and positive predictive values (PPVs) were calculated for the seven different peritoneal effusion specimens (the 10, 50, 100, 150, 200, 250, and 300 mL volumes). Four measures of six aliquot specimens (the 10, 50, 100, 150, 250, and 300 mL volumes) were compared with the corresponding values of the 200-mL aliquot. This study was a randomized and single-blinded prospective study based on patients from the Departments of Gynecology and Obstetrics and Gastroenterology and Hepatology, and all authors had access to the study data and reviewed and approved the final manuscript. The study was approved by the institutional review board of our university. We confirm that all research was performed in accordance with the relevant guidelines and regulations. Informed written consent was obtained from all individuals and/or their legal guardians. A Chi-squared test was applied to analyze the relationship between the demographics, the cell block results' information, and the malignancy diagnosis. A P value of less than 0.05 was considered statistically significant. The data were statistically evaluated using SPSS v19.0 software packages. The demographic data and characteristics of all the patients and controls are presented in [Table 1]. During the study period, 123 patients who had greater than or equal to 1,000 mL of ascitic fluid were recruited, including 69 females and 54 males. The patients ranged in age from 28 to 83 years with a mean age of 63 years. 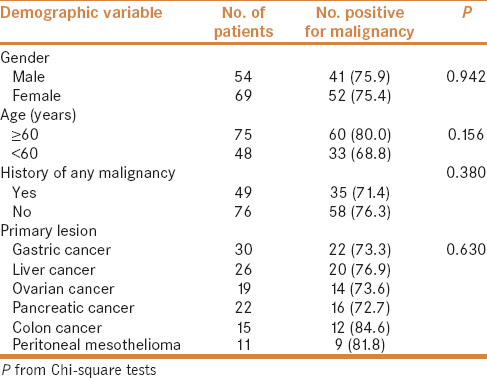 A total of 93 patients (75.6%) had a previous diagnosis of malignancy. The differences in gender (P = 0.942), age (P = 0.156), and history of any malignancy (P = 0.380) were not statistically significant. The primary tumors of the study group are also shown in [Table 1]. We demonstrated that there was no significant difference in the sensitivity of the different cancers (P = 0.630). The most common cancer was gastric cancer, which was detected in 30 of the 123 patients (24.9%), followed by liver cancer in 26 of the 123 patients (21.1%). The total number of malignant ascites confirmed by all the methods described above was 93, which represented 75.6% of all the recruited patients. Due to lack of fluid volume, one patient's sample was discarded. There was another patient whose cell block information was lost prior to blinding. These two patient samples were discarded from the following analyses, leaving a final sample size of 121 patients, with 93 (76.9%) of these being positive for malignancy. As shown in [Figure 1], the sensitivities of each aliquot of different primary cancers varied, and the different volumes of each aliquot also yielded dissimilar results. 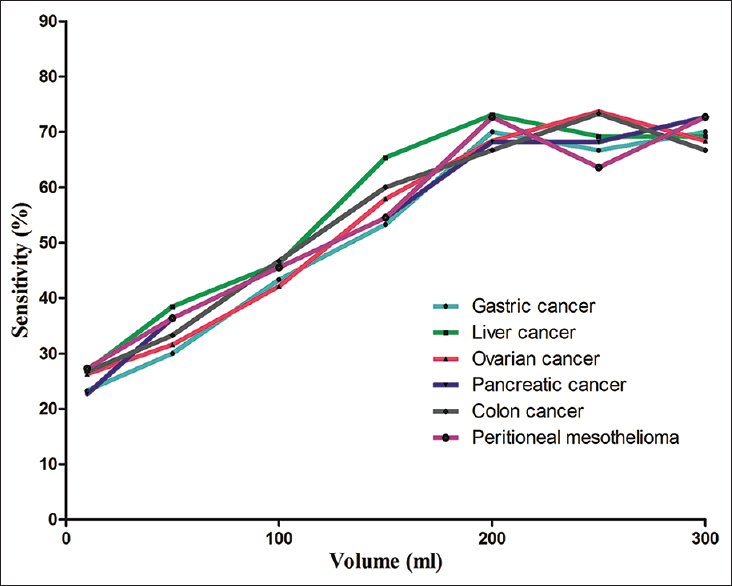 When the volume was 10 mL, the sensitivity of the different cancers (gastric cancer, liver cancer, ovarian cancer, pancreatic cancer, colon cancer, and peritoneal mesothelioma) was 23.3%, 26.9%, 26.3%, 22.7%, 26.7%, and 27.3%, respectively; when the volume was 50 mL, these sensitivities were 30%, 38.5%, 31.6%, 36.4%, 33.3%, and 36.4%, respectively; when the volume was 100 mL, these sensitivities were 43.3%, 46.2%, 42.1%, 45.5%, 46.7%, and 45.5%, respectively; when the volume was 150 mL, these sensitivities were 53.3%, 65.4%, 57.9%, 54.5%, 60.0%, and 54.5%, respectively; when the volume was 200 mL, these sensitivities were 70.0%, 73.1%, 68.4%, 68.2%, 66.7%, and 72.7%, respectively; when the volume was 250 mL, these sensitivities were 66.7%, 69.2%, 73.7%, 68.2%, 73.7%, and 63.6%, respectively; and when the volume was 300 mL, these sensitivities were 70.0%, 69.2%, 68.4%, 72.7%, 66.7%, and 72.7%, respectively. The above data show that the sensitivity of all six cancers increased as the sample volume increased and plateaued when the specimen volume reached 200 mL. The findings further illustrated that there was no significant difference in the sensitivities of the different cancers. Thus, we suggest that the volume of 200 mL is the optimal cutoff for the detection of malignancy in peritoneal fluid. [Table 2] contains all the numbers of the available samples and the positive results, together with the sensitivities, specificities, PPVs, and NPVs for the six fluid volumes using the paraffin-embedded cell block technique. As depicted in [Table 2], the different specimen volumes yielded different positive rates, and the more precisely positive rates increased as the detection volume enlarged. The significant differences between the 10- and 200-mL volumes (P = 0.000 and P = 0.008), between the 50- and 200-mL volumes (P = 0.000 and P = 0.020), between the 100- and 200-mL volumes (P = 0.000 and P = 0.032), and between the 150- and 200-mL volumes (P = 0.000 and P = 0.044) were significant for sensitivity and NPV. There were moderate increases in the sensitivity and NPV between the 250- (P = 0.857 and P = 0.906) and 200-mL volumes and between the 300- (P = 0.582 and P = 0.791) and 200-mL volumes. However, no significant differences in the sensitivity and NPV values were observed between the 250- and 200-mL volumes or between the 300- and 200-mL volumes. No statistically significant difference in any aliquot volume of ascites was observed for the specificities or PPVs. Malignant ascites is associated with a wide range of neoplasms, such as colorectal, stomach, pancreatic, and ovarian cancers. The accumulation of massive amounts of malignant ascites is a significant cause of morbidity and mortality in patients with abdominal neoplasms., Indeed, malignant ascites is a poor prognostic indicator for most malignancies, with a mean life expectancy of approximately 6 months., Although many physical examinations, invasive methods, and several protein markers, such as carcinoma antigen 125, alpha fetoprotein, prostate-specific antigen, and carcinoembryonic antigen, are used to differentiate malignant ascites from benign ascites,, few studies, if any, have sought to determine the optimal volume of ascites obtained by peritoneocentesis to diagnose malignancy. To compare the interobserver reliability, at the beginning of our study, all the aliquot samples were reviewed open-label by a senior and junior staff pathologist to determine whether malignant cells were present; the results were then reported as positive or negative. The results were compared using the kappa test method. When the value of kappa is greater than 0.7, it demonstrates a high degree of consistency, and when it is less than 0.4, this demonstrates a low degree of consistency. When the value of kappa varies from 0.4 to 0.7, it demonstrates good consistency. The cytological diagnosis results of the two pathologists are shown in [Table 3]. The value of kappa was 0.734, which is higher than 0.7, and the value of P was 0.000, which is less than 0.05. These results indicated that the cytological diagnostic results did not differ significantly between the two pathologists. Thus, only one pathologist performed the following trials. In patients with ascites and a suspicion of cancer, cytopathology is the gold standard test for confirming the presence of tumor cells. Cytopathology is well established as a sensitive, noninvasive tool for diagnosing malignant peritoneal effusion. Although a malignant marker is not detected in some malignant ascites, the application of such markers is proposed in the diagnosis of malignancy. However, compared with cytological diagnosis, the specificity and sensitivity of tumor marker detection in the diagnosis of ascites do not demonstrate a clear advantage.,, Thus, cytology of ascites is the gold standard to diagnose malignant ascites, although its sensitivity ranges only between 50% and 70%, which may be caused by the fact that a primary tumor might infiltrate the peritoneum but not shed cells, leading to a negative cytology result. The traditional method of cytology of the pleural effusion and ascites has the advantage of feasibility, short performance time, and low cost. However, this traditional process tends to be negatively affected by many undesirable factors, including the time length of specimen storage, the thickness of the slice, solidification, dyeing quality, and so on. Due to technical limitations, materials, production, lack of organization structure, and cell degeneration, cytology will inevitably lead to a missed diagnosis or a misdiagnosis. Effectively reducing the missed diagnosis and misdiagnosis of cytology is a basic requirement. A higher sensitivity depends on a good cytologic technology. To ensure the reliability of the cytology results, the clinicopathological results, the laboratory findings and the results of the biochemical examination were verified in this study, which could maximally reduce cytology results of a missed diagnosis or a misdiagnosis. A paraffin-embedded cell block collects more cellular components, which are not affected by the formation of ascites, the cell components are more concentrated, and the reading time is shortened to a certain extent. Thus, the paraffin-embedded cell block technique was used for the cytologic examination in this study. This approach not only increases the sensitivity but also helps better demonstrate the architectural patterns, which could be of great assistance in making the correct diagnosis of the primary lesion. Many additional factors related to the preparation of paraffin-embedded cell blocks may affect the results; thus, careful attention should be paid during this process. For instance, the specimens should be kept fresh, and the slice should be made as soon as the specimen is sent to the laboratory. If smears cannot be made promptly, anticoagulation should be applied to the specimens to prevent clotting and autocytolysis. In addition, all the specimens were spun in a centrifuge at 1,500–2,000 r/min for 5–10 min. In this study, we examined 123 peritoneal specimens collected over a period of 22 months; we aimed to recruit as many patients as possible to help us determine the optimal cutoff volume for peritoneocentesis specimens. Swiderek et al. demonstrated that a thoracentesis sample volume of at least 60 mL performed better than a volume of 10 mL and that 75 mL was the minimum fluid volume to make the diagnosis of malignancy. This study was performed to evaluate the optimal volume of ascitic fluid required to make the diagnosis of malignant ascites. To our knowledge, no study has been performed previously to determine the optimal volume of ascitic fluid. As we had no relevant reference, we used 50 mL as the volume gradient because the specification of the syringe that is used in the clinic to tap ascites is 50 mL, and the first pumping of ascites should be less than 1,000 mL. The sensitivity measures the proportion of the positive results that are correctly identified as such. The sensitivity and the false-negative rate are complementary, and the false-negative rate is equal to the rate of a missed diagnosis. Therefore, a higher sensitivity indicates less missed opportunities for diagnosis. The NPV is the proposition of the negative results in the statistics and diagnostic tests that are true-negative results, and a higher sensitivity suggests a higher NPV. In this study, we determined that there was a higher NPV for the 200-mL volume than for the 10-, 50-, 100-, and 150-mL volumes. Although there was no statistically significant difference between the 200- and 250- or 300-mL volumes, our study showed an incremental increase in the sensitivity with the increased volume of ascites used for the analysis. No statistically significant difference in any aliquot volume of ascites was observed for the specificity or PPV. A reasonable selection of the specimen volume and the number of specimens can maximally reduce the misdiagnosis rate and avoid a repeated submission. Thus, we suggest submitting 200 mL when diagnosing malignancy in the clinic. For the patients who were diagnosed with malignant ascites by peritoneocentesis, the types of cancer cells identified were consistent with previous literature., These findings suggest that gastrointestinal cancer is the most common cause of malignant ascites. Previous studies have suggested that more females will have malignant ascites because ovarian cancer is the most common cause of malignant ascitic fluid in females. In our study, gastrointestinal cancer in patients diagnosed with malignant ascites was the most common, and ovarian cancer was the most common among females, which is consistent with previous literature. Because of the NPV and PPV associated with the cell block technique, some invasive procedures, such as laparoscopy, are needed to confirm the presence of malignancy. For instance, the diagnosis of peritoneal malignancy is dependent on abdominal paracentesis and abdominal computed tomography. The incidence of stomach cancer and liver cancer was highest in the malignant ascites. When we ran a blind analysis, one patient's sample had missing cell block information and thus could not be included in our final analysis. There were 13 patients who underwent more than one peritoneocentesis in which more than one ascites sample was analyzed in our study; however, the results were consistent with the results for the pleural fluid and were identical when only the first sample was analyzed. This study has some limitations. First, when we recruited the patients, we only included patients with gastric, liver, ovarian, pancreatic, and colon cancer, or peritoneal mesothelioma. However, malignant ascites can also be caused by many other types of cancer, such as esophageal cancer, lymphoma, and cholangiocarcinoma. Therefore, our studies might not reflect all causes of malignant ascites. However, the cases that were not recorded in our study have a low incidence, and we would not have recruited a sufficient number of patients in a short period of time. In addition, we found that the positive rate of diagnosis of malignant ascites was not significantly different for various types of tumor cells. Second, our study reports results from a single institution. Thus, our results need to be verified in larger samples and in randomized controlled multicentered clinical trials. Finally, all the patients in our study provided greater than or equal to 1,000 mL of ascites, and patients with no shifting dullness were not included in our study. We found that 200 mL was the optimal volume to diagnose malignancy, but the optimal volume for patients with a smaller volume of ascites was not straightforward. In the clinic, we collect any volume of ascites to diagnose malignancy. According to our prospectively derived data, we suggest that 200 mL is the optimal minimum volume for the diagnosis of malignant ascites with shifting dullness. In particular, we should pay attention to the heterogeneous distribution of the cells within the ascites. The cells in the ascitic fluid are subject to a gravity-dependent gradient, which creates an environment that is more likely to detect the malignant cells. Thus, before the collected ascites is separated, all the specimens should be agitated to eliminate the effect of the gravity-dependent gradient. This study is the first to prospectively determine the optimal minimum volume required for an accurate cytological diagnosis of malignancy in peritoneal fluid. The results indicate that higher volumes yield higher sensitivities for the detection of malignancy, which may be caused by the fact that there are more malignant cells in a larger volume of ascitic fluid. However, single-factor analysis of the ascites cytological examination demonstrated that 200 mL was the optimal cutoff volume required for an accurate cytological diagnosis of malignancy in patients who provide greater than or equal to 1,000 mL ascites. Therefore, we recommend that physicians submit at least 200 mL or more of the peritoneocentesis specimen for cytological analysis whenever a diagnosis of malignant ascites is sought. Smith EM, Jayson GC. The current and future management of malignant ascites. Clin Oncol 2003;15:59-72. Sangisetty SL, Miner TJ. Malignant ascites: A review of prognostic factors, pathophysiology and therapeutic measures. World J Gastrointest Surg 2012;4:87-95. Bignotti E, Todeschini P, Calza S, Falchetti M, Ravanini M, Tassi RA, et al. Trop-2 overexpression as an independent marker for poor overall survival in ovarian carcinoma patients. Eur J Cancer 2010;46:944-53. Saâda E, Follana P, Peyrade F, Mari V, François E. Pathogenesis and management of refractory malignant ascites. Bull Cancer 2011;98:679-87. Fleming ND, Alvarez-Secord A, Von Gruenigen V, Miller MJ, Abernethy AP. Indwelling catheters for the management of refractory malignant ascites: A systematic literature overview and retrospective chart review. J Pain Symptom Manage 2009;38:341-9. Bhanvadia VM, Santwani PM, Vachhani JH. Analysis of diagnostic value of cytological smear method versus cell block method in body fluid cytology: Study of 150 cases. Ethiop J Health Sci 2014;24:125-31. Thapar M, Mishra RK, Sharma A, Goyal V, Goyal V. Critical analysis of cell block versus smear examination in effusions. J Cytol 2009;2660-64. Tajima S, Kawabe A, Nagasaka K, Oda K, Kawana K, Fukayama M. A case of successful detection of disseminated gastrointestinal stromal tumors by ascites smear cytology using cell block preparation with DOG1 immunostaining. Diagn Cytopathol 2016;44:137-40. Sherer DM, Eliakim R, Abulafia O. The role of angiogenesis in the accumulation of peritoneal fluid in benign conditions and the development of malignant ascites in the female. Gynecol Obstet Invest 2000;50:217-24. Takeda A, Shimada H, Imaseki H, Okazumi S, Natsume T, Suzuki T, et al. Clinical significance of serum vascular endothelial growth factor in colorectal cancer patients: Correlation with clinicopathological factors and tumor markers. Oncol Rep 2000;7:333-8. Woopen H, Sehouli J. Current and future options in the treatment of malignant ascites in ovarian cancer. Anticancer Res 2009;29:3353-9. Aslam N, Marino CR. Malignant ascites: New concepts in pathophysiology, diagnosis, and management. Arch Intern Med 2001;161:2733-7. Gerbes AL, Jüngst D. Role of cholesterol determination in ascitic fluid analysis. Hepatology 2009;50:1320. Trapé J, Gurt G, Franquesa J, Montesinos J, Arnau A, Sala M, et al. Diagnostic accuracy of tumor markers CYFRA21-1 and CA125 in the differential diagnosis of ascites. Anticancer Res 2015;35:5655-60. Antony VB. Drawing the line: Differentiating transudates from exudates. Respiration 2002;69:198. Topolcan O, Holubec L, Polivkova V, Svobodova S, Pesek M, Treska V, et al. Tumor markers in pleural effusions. Anticancer Res 2007;27:1921-4. Porcel JM, Vives M, Esquerda A, Salud A, Pérez B, Rodríguez-Panadero F. Use of a panel of tumor markers (carcinoembryonic antigen, cancer antigen 125, carbohydrate antigen 15-3, and cytokeratin 19 fragments) in pleural fluid for the differential diagnosis of benign and malignant effusions. Chest 2004;126:1757-63. Motherby H, Nadjari B, Friegel P, Kohaus J, Ramp U, Böcking A. Diagnostic accuracy of effusion cytology. Diagn Cytopathol 1999;20:350-7. Swiderek J, Morcos S, Donthireddy V, Surapaneni R, Jackson-Thompson V, Schultz L, et al. Prospective study to determine the volume of pleural fluid required to diagnose malignancy. Chest 2010;137:68-73. Rooper LM, Ali SZ, Olson MT. A minimum fluid volume of 75 mL is needed to ensure adequacy in a pleural effusion: A retrospective analysis of 2540 cases. Cancer Cytopathol 2014;122:657-65. Harding V, Fenu E, Medani H, Shaboodien R, Ngan S, Li HK, et al. Safety, cost-effectiveness and feasibility of daycase paracentesis in the management of malignant ascites with a focus on ovarian cancer. Br J Cancer 2012;107:925-30. Gotlieb WH, Feldman B, Feldman-Moran O, Zmira N, Kreizer D, Segal Y, et al. Intraperitoneal pressures and clinical parameters of total paracentesis for palliation of symptomatic ascites in ovarian cancer. Gynecol Oncol 1998;71:381-5. Kumaran GC, Jayson GC, Clamp AR. Antiangiogenic drugs in ovarian cancer. Br J Cancer 2009;100:1-7.